Second half and the game was over as a contest as Emmets failed to score in the half, but did find the target only to drop short 11 balls into the keepers hands. Desmonds socrers of the half were Owen Murphy 1.01, Thomas Hickey 0.02, Michael Walsh 0.01 and Kerry minor trail players subs Shane OConnor 0.01, and Cian OConnor 0.02 Desmonds will be much the happier outfit after two comperhensive wins in the first two rounds of the league. Emmets had a good win over Brosna on Sunday last and were the stronger side in the first half and enjoyed a 1-6 to 4 points lead at half time. The goal coming from wing forward Darren Halpin. Brosna were the better team in the 2nd half with Mike Finnegan scoring 2 excellent points from wing back. Listowel's solitary score in the 2nd half came from Cormac Mulvihill which turned out to be the winner. 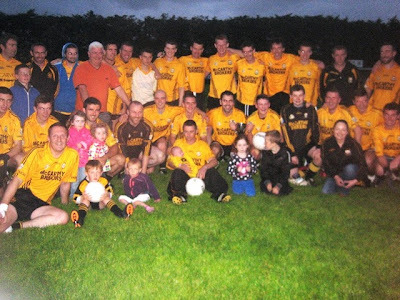 Brosna had chances in the final few minutes to level the game but they were unable to find that all important score. Final score Brosna 9 points, Listowel 1-07. Credit due to both sides as conditions on the day were far from ideal. Teams Moyvane Brendan Galvin, Shane Stack, Bill Madden, Connor Flynn, James Flavin, Denis Kennelly, Nial Sheehan, Donal Leahy, John Jack Mulvihill, Kevin Kennelly, P.J Reynolds, David Moloney, D.J Keane, Diarmuid Leahy, Timmy Noonan, subs Diarmuid Fitzmaurice for Brendan Galvin, P,J Stack for P.J Reynolds, Ian McCarthy for Kevin Kennelly, Timmy Kennelly for Connor Flynn, James Kennelly for Timmy Noonan.